Opening presents during the holidays can sometimes be a little awkward. While you’re opening a gift, the giver – and other people who may be in the room – watch expectantly for your reaction. One furrowed brow or downturned lip is a dead giveaway that you don’t care for the gift. Oops! Don’t grimace. Social faux pas. Whether the gift pleases you or not, it’s always best to graciously accept the gift and politely thank the gift-giver, including with a hand-written thank-you note sent by snail mail. Generally, it’s never a good idea to give back a gift. People give gifts as an expression of love, caring, friendship or appreciation. Turning down a gift can be considered rude, insulting, inconsiderate and bad manners, and complete disregard for the meaning of giving. You already own the same one. Explain to the gift-giver that you appreciate the thoughtfulness but that you already have the exact same item. Politely ask if it would be alright for you to exchange the gift at the store where it was bought. Many stores will provide the purchaser with a “gift exchange” receipt that does not show the price, for just such eventualities. The gift-giver is your spouse or an immediate family member. Politely tell him or her how much you appreciate the gift and the thoughtfulness, and ask if it would be OK to exchange it for a different size or color, for example. You can’t use it. Consider donating such gifts to a charity, so that they can benefit adults or children in need. You can’t exchange it. Many people re-gift a gift to someone else. Whether a gift was inexpensive or expensive, re-gifting can be a logical and positive solution. Just be sure that you don’t re-gift the gift to the person who gave it to you. It was personalized. Gifts that are personalized with your name, initials, personal message, birthstone or other defining characteristic show that the giver put a great deal of thought and caring into making the selection. It was made by hand, by a family member or good friend. These gifts are worth more in sentiment than the cost or usefulness. Treasure them, and maybe pass them on to your children or grandchildren. For more gift-giving etiquette, check such authoritative sources as Emily Post, available at bookstores and online at www.emilypost.com. Did you receive a gift card that you don’t plan to use? You’re not alone. 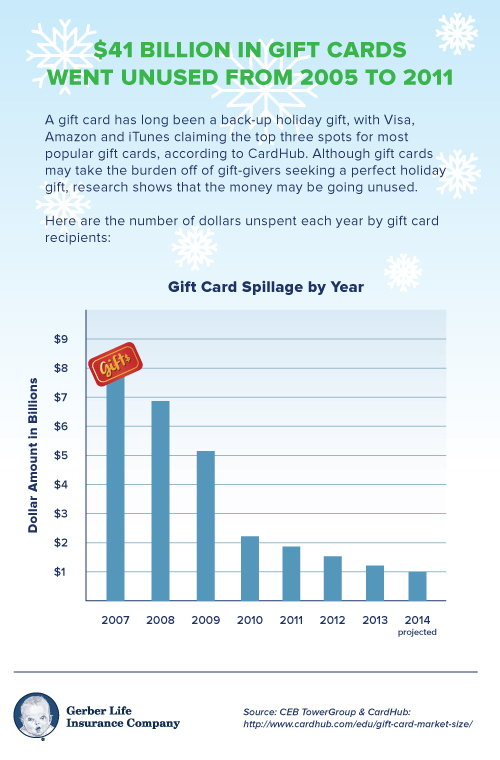 Check out the infographic below to see how much gift card money goes unspent each year. If you have more than a few unwanted gift cards piling up in your junk drawer, consider re-gifting them or bringing them to a kiosk that may allow you to exchange them for cash.